The SC729 is a flip phone with the classic flip design. New and upgraded, this version definitely has an edge on its predecessors. With cutting edge M4/T4 hearing aid compatibility and an upgraded software, no other flip phone comes close to this quality. This phone will work on the majority of 3G WCDMA or 2G GSM networks in North America, as well as Canada. Some examples include T-Mobile, AT&T, Rogers, Bell, Telus, and much more. The SC729 has a significantly enhanced volume; it even equips with a speaking keyboard feature that can turn on and off. On the back of this phone, you will find that there is a very convenient SOS Panic Button that can call up to 6 contacts in order and also send out a customizable text message. This phone will even come with a built-in FM radio that can plays wherever you are. Simplicity at it is best; the SC729 has a loudspeaker and large display, so you can enjoy the most reliable phone you have ever used at ease. Tested and comply with FCC and IC Standards with certifications. Large 2.4" bright LCD Screen w/ dual themes (Black or White background) selection, 24 and 12 hour format display, US standard Date display format, Long lasting battery life. Bluetooth 3.0+ A2DP, Enhanced Rear Camera, Free Quick Charging Dock, Memory Can Store Up to 200 Phonebook Entries, Enhanced Speaker Volume, M1, M2 and M3 Dedicated Direct dial keys, Key 2 - Key 9 Speed dials. Cutting Edge M4/T4 Hearing Aid Compatibility, ideal for the customers with hearing aid devices. 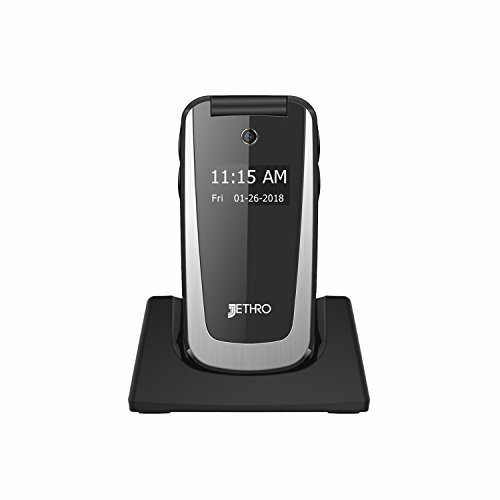 If you have any questions about this product by Jethro, contact us by completing and submitting the form below. If you are looking for a specif part number, please include it with your message.